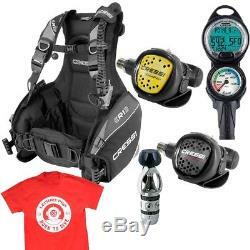 Cressi R1 BC, Leonardo, Compact Regulator Octopus Scuba Diving Package. 1'st Stage, 2'nd Stage, Octopus, LP Hoses, BCD with 3/8" Threaded QD Hose, Computer Console with Pressure Gauge, HP 7/16" Threaded Hose, Online Class and Owner's Manuals. The XS Compact AC2 Regulator is an exceptionally dependable non-balanced flow-by-piston designed 1'st stage Regulator that is a great choice as a new diver's rig, or for use as a stage bottle regulator system. The 1'st stage has 1 HP port and 4 LP ports and is made from marine grade chromed brass for long life and durability. A conical filter is used which has greater surface area for higher air flow characteristics through the 1'st stage regulator. The XS Compact Second-Stage housing is made of durable non-corrosive hi-tech polymers and has a dependable downstream demand valve mechanism. The flow of air is channeled to the mouthpiece by injection, creating a venturi effect enhancing the performance. The 2nd stage comes with a flow deviator that acts on the venturi effect, with dive/pre-dive adjustment function. Large soft purge cover allows easy clearing of 2'nd stage and a comfortable silicone mouthpiece. The XS Compact Regulator and Octopus come with a 3/8 hoses and owner's manual. The Cressi Leonardo Computer Console is an elegant expression of a simple and functional design the Leonardo is a must have for divers entering the sport and those who just want to dive. A single button interface makes it effortless to program Air, Nitrox and Gauge Modes. Leonardo has a large edge-to-edge, high definition LCD screen that gives large numerical displays in a computer that is still compact and travel friendly. The Leonardo's easy-to-see battery life icon indicator and its distinct audible alarms deliver critical information as well as peace-of-mind during the dive. The Leonardo features a new Cressi RGBM algorithm, created in conjunction with the expertise of Bruce Wienke and based on the Haldane model, integrated with RGBM factors. This algorithm allows for safe decompression calculations for multiple dives spread out over multiple days. The Leonardo computer by Cressi is a multifunctional instrument for sport diving. It will supply any wanted information on depth, dive times, decompression status, ascent rate and surface interval times between dives. Nitrogen absorption and release is continuously processed by its sophisticated software, considering the quantity of inert gases in the different mixtures which can be used. Such information is Displayed on the Instrument's Large Display, thanks to the PCD (Priority Compartment Digit Display) system, allowing an easy and direct dialogue between the diver and the computer, ensuring a clear understanding of all the data needed at any given time and a perfect readability in any situation. The computer is provided with clock and calendar, a versatile dive memory (logbook), as well as a dive simulator. The mathematical model of Leonardo can make saturation and de-saturation computations of dives carried out both with air and with Nitrox, whose parameters can all be set: from the maximum allowed PO2 value between 17.4 and 23.2 psi (1.2 bar and 1.6 bar), to the mixture's oxygen percentage (FO2) between 21% and 50% of O2. Additionally, the instrument may be set by the user for either imperial (feet) or metric (meters) system. The Leonardo can also be fully re-set after each use, making it an excellent choice for rental departments. The Cressi Leonardo Dive Computer has an operational depth from 0' to 393' (0 to 120 meters), is powered by a user replaceable CR2430 3-volt battery and is equipped with a 60 dive (70 hour) logbook memory function. The clock function can be set in a 12/24-hour formats. The computer is also altitude adjustable up to 12,139' (3,700 meters) and has a back-light feature for low light conditions. The computer comes with a comprehensive owner's manual. The Cressi R1 is a rugged BCD with the Flat Lock Aid Integrated Weight System. The R1 BCD is made of durable 500-Denier Cordura internally urethane laminated color-lock nylon material. The BCD comes with a rigid back pack that is padded and is equipped with a built-in carry handle. The R1 is also fitted with features such as a rear kidney and right shoulder pull dumps, an inflator integrated pull dump on the left shoulder and manual deflation from the inflator assembly. Two large zipped pockets can be found on either side of the BCD for convenient storage of accessories. The R1 harness system uses traditional squeeze-style quick-release buckles and adjustable straps on the shoulders, chest and waist for precise adjustment and fit. A hook and loop adjustable waist cummerbund provides extra security and comfort. The Cressi R1 BCD comes with the integrated Lock Aid Quick-Release Weight System that hold up to 20 lbs. (9 kg), with 10 lbs. (4.5 kg) in each pocket. Light-alloys have been used to make the D-rings in place of traditional stainless steel with 2-D-rings pre-bent for easier attachment of accessory Items. The R1 provides from 16.9 lbs. (7.6 kg to 16.33 kg) of Lift depending on the BCD Size. The Cressi R1 BCD is available in multiple sizes, comes with 3/8 low-pressure hose and owner's manual. Heads will turn as you sport this great looking T-shirt by Leisure Pro. Be a part of the team! Share with the world what you were born to do. The Leisure Pro Born to Dive Team T-shirt is available in red and is 100% cotton. Front of shirt boasts a hard hat helmet logo with Leisure Pro and Born to Dive Print. The back of the shirt shows the Leisure Pro Diver Emporium Logo. Cressi R1 BC, Leonardo, Compact Regulator & Octopus Package. Complete Life Support System Package. All You Need is Water! Regulator: Cressi XS Compact AC2. First Stage:Cressi AC2 Regulator. Construction: Durable Marine Grade Chromed Brass. 1 HP Port 7/16 Thread. 4 LP Ports 3/8 Thread. Second Stage:Cressi XS Compact Regulator. Octopus:Cressi XS Compact Octopus. Computer:Cressi Leonardo Computer Console. Elegant Expression of a Simple and Functional Design. Single Button Interface for Effortless Programming. Modes: Air, Nitrox and Gauge. Large Edge-to-Edge, High-Definition LCD Screen. Easy-to-See Battery Life Icon Indicator. Algorithm: RGBM Algorithm, Bruce Wienke/Haldane Model. Safe Decompression Calculations for Multiple Dives Over-Multiple Days. Multifunctional Instrument for Sport Diving. Depth, Dive Times, Decompression Status. Ascent Rate and Surface Interval Times. Nitrogen Absorption and Release is Continuously Processed. PCD (Priority Compartment Digit Display) System. Easy and Direct Dialogue Between Diver and Computer. Perfect Readability in Any Situation. Versatile Dive Memory (logbook): 60 Dives or 70 Hours On-Board Log. PO2 Value between 17.4 and 23.2 psi (1.2 bar and 1.6 bar). (FO2) between 21% and 50% of O2. Imperial (feet) or Metric (meters) System Selectable. Reset Function for Multiple Users. Operational Depth: 0' to 393' (0 to 120 meters). User Replaceable CR2430 3-Volt Battery. Altitude Adjustable Up to 12,139' (3,700 meters). Back Light Feature for Low Light Conditions. Pressure Readout: 0 to 5,000 psi. Unique Glass Lens Pressure Relief Valve. Luminescent 3 Zone Color Coded Dial: Zone 1: 0 to 600 psi Red Reserve Air w/Fade to 1,300 psi for Deep Dive Reserve Zone 2: 600 to 3,000 psi Green Zone 3: 3,000 to 5,000 psi Blue. Small, Modern Shaped Compact SPG. Leisure Pro Team T-Shirt, Red. Sport the Leisure Pro Team Shirt. Show What You Were "Born to Do". Shirt Front: Hard Hat Helmet Logo w/Leisure Pro and Born to Dive Print. Back Shirt: Leisure Pro Diver Emporium Logo. First Stage: Chromed Brass, Second Stage: Polymer Plastic. (7.67 kg), SM; 20.2 lbs. (9.16 kg), MD; 23.6 lbs. (10.7 kg), LG; 33.7 lbs. (15.3 kg), XL; 36.0 lbs. 3-Dump/Overpressure Relief Valves, Right Shoulder & Lower Rear Over-Pressure Relief/Pull Dump Valve, Left Shoulder Cable Activated Pull Dump. Adjustable Torso Straps w/"Squeeze-Style" Side Release Buckle. Adjustable Waist Strap w/"Squeeze-Style" Side Release Buckle and Cummerbund Pad. Yes, Adjustable Sternum w/"Squeeze-Style" Side Release Buckle. Cressi Power Inflator w/Cable-Activated Pull Dump. Internally Urethane Laminated 500-Denier Cordura Nylon. 0' to 393' (0 To 120 meters). Yes, Up to 12,139' (3,700 meters). 0 to 5,000 psi. Feedback is a very powerful tool. Please do not request to have an item relisted if you do not see it any more. If we are able to relist, we will do so even without your request. We will not mark any package as a gift. You will get that automatically. Then, we give another 90 days (120 days from the date of invoice) to return for store credit. We won't even ask why you've changed your mind. Please wait 8 days from date we received the package for us to process your return. The item "Cressi R1 BC, Leonardo, Compact Regulator Octopus Scuba Diving Package" is in sale since Wednesday, September 19, 2018. This item is in the category "Sporting Goods\Water Sports\SCUBA & Snorkeling\Buoyancy Compensators". The seller is "leisurepro" and is located in Elizabeth, New Jersey. This item can be shipped to United States.